In the toddler rooms we help the children learn to respect themselves, friends and the world around them. Weekly themes and developmentally appropriate activities are designed to focus on the rapidly developing skills of the toddler. Story time, music, dramatic play, and free play are just some of the components of this program. The Bunny Room cares for children from 16 months up to 30 months of age. 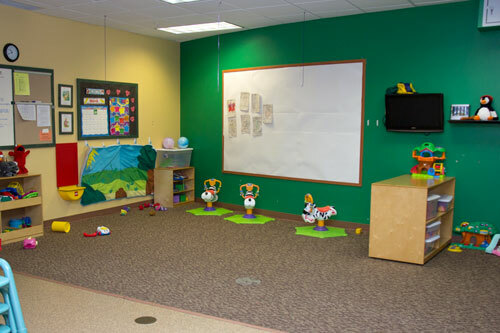 In the Bunny Room, we begin introducing the children to group time, music lessons, Chapel and more advanced art. Your child will also begin learning about the seasons, basic color and shape recognition, recognizing animals and animal sounds, as well as learning about the world around us. We offer weekly themed lesson plans to help your child prepare for our pre-school program. 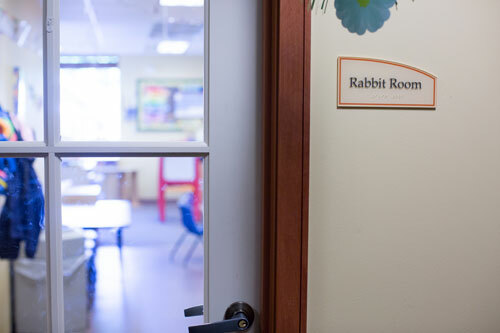 The Rabbit Room cares for children from 30 months up to 48 months of age. The Rabbit Room offers many opportunities for growth and development, with more advanced planning in the daily activities which include music, art, group time, story time, building block time, dramatic play and much more. Continuing to prepare your child for our pre-school program, your child will continue working on self help skills including potty training, hand washing, and brushing teeth.